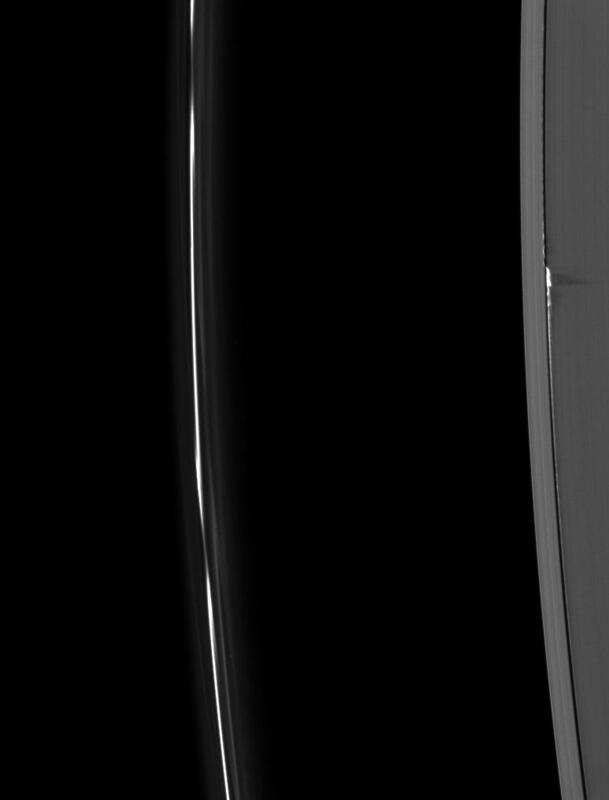 Ring material, pulled to spectacular heights above the ring plane by the gravity of the moon Daphnis, casts long shadows on Saturn's A ring in this Cassini image taken about a month before the planet's August 2009 equinox. The shadows in this image have lengths as long as 500 kilometers (310 miles), meaning the structures casting the shadows reach heights of almost 4 kilometers (2.5 miles) above the ring plane. These heights are much greater than those previously observed for the Daphnis edge waves (see PIA11654), and are very likely caused by the distance between Daphnis and the inner edge of its gap getting unusually small at certain times. Daphnis (8 kilometers, or 5 miles, across) is a bright dot in the Keeler Gap of the A ring on the right of the image. The moon has an inclined orbit, and its gravitational pull perturbs the orbits of the particles of the A ring forming the Keeler Gap's edge and sculpts the edge into waves having both horizontal (radial) and out-of-plane components. Material on the inner edge of the gap orbits faster than the moon so that the waves there lead the moon in its orbit. Material on the outer edge moves slower than the moon, so waves there trail the moon. See PIA11655 to learn more and to see a movie of this process. The thin F ring on the left of the image shows the perturbations caused by the moon Prometheus. See PIA08397 to learn more. This image and others like it are only possible around the time of Saturn's equinox which occurs every half-Saturn-year (equivalent to about 15 Earth years). The illumination geometry that accompanies equinox lowers the sun's angle to the ring plane, significantly darkens the rings, and causes out-of-plane structures to cast long shadows across the rings. 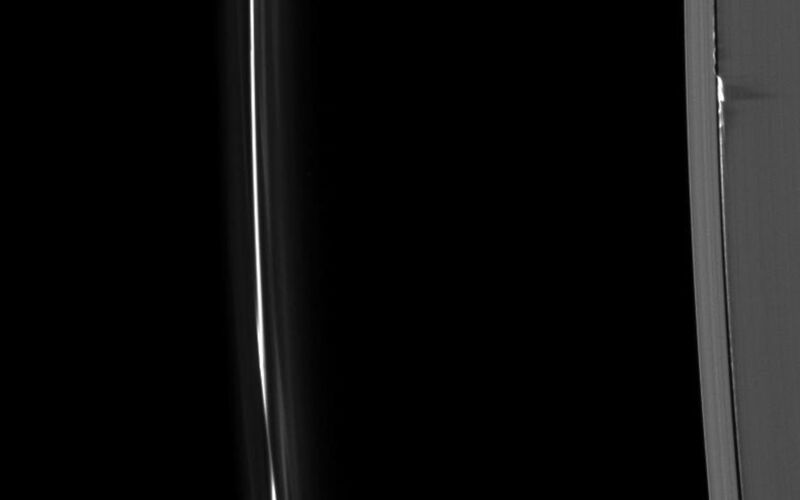 Cassini's cameras have spotted not only the predictable shadows of some of Saturn's moons (see PIA11657), but also the shadows of newly revealed vertical structures in the rings themselves (see PIA11664). 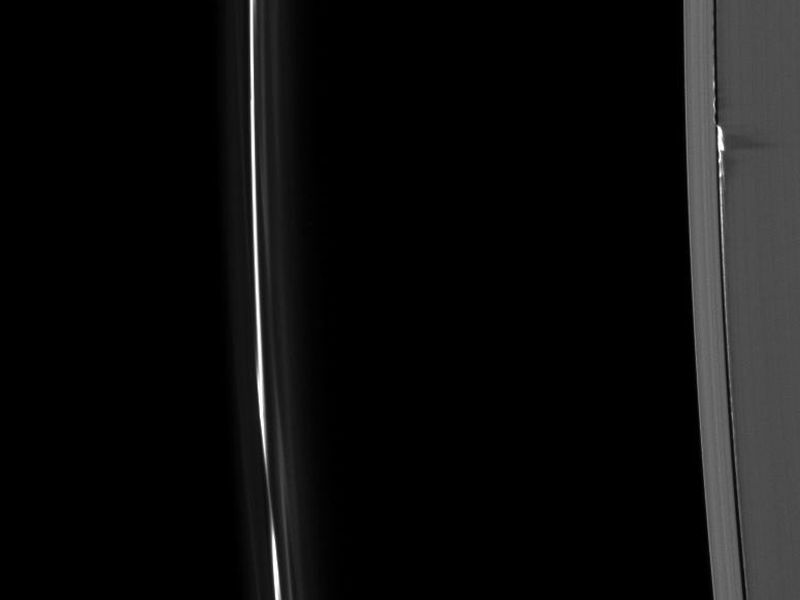 This view looks toward the unilluminated side of the rings from about 42 degrees above the ring plane. The image was taken in visible light with the Cassini spacecraft narrow-angle camera on July 13, 2009. The view was obtained at a distance of approximately 1.5 million kilometers (932,000 miles) from Saturn and at a Sun-Saturn-spacecraft, or phase, angle of 84 degrees. Image scale is 9 kilometers (5 miles) per pixel.